I am fairly familiar with the works of Edgar Rice Burroughs. I’ve read and enjoyed pretty much all of the Tarzan novels, the tales of Barsoom, the adventures of Pellucidar, and a handful of others. But I’d never run across The Lost Continent until the other night when I was searching for something entirely different on the Project Gutenberg list of titles. I downloaded it almost immediately, largely because it sounded like it might have some connections to Sir Arthur Conan Doyle’s The Lost World, which I also enjoyed mightily. 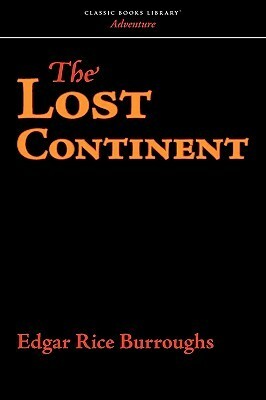 Instead, The Lost Continent is a fascinating, unexpected disquisition on war and its horrors, set in the year 2137. Twenty-year-old Pan-American naval lieutenant Jefferson Turck is patrolling the 30th meridian east when his flying submarine becomes disables. Strict laws forbid transgressing the thirty (as it is called in the story, hence the original title, Beyond Thirty) or the 175th meridian west, the two official boundaries of Pan-America. Beyond them lies…well, no one knows, since for two centuries no one had passed beyond the two lines and returned to tell about it. No word has been received from either Europe or Asia since 1937, at the height of the Great War. Lieutenant Turck realizes that his crippled ship cannot reach Pan-America safely, so he steers for England. Along the way, he and a handful of crew are abandoned when they set out in a smaller boat to fish. Now, Turck and his men have no choice but to continue onward and face…whatever is there to find. What they discover, and Turck’s various adventures, constitute the bulk of The Lost Continent. Suffice it to say as a teaser that England—called by its natives “Grubitten” or “Grubritten,” has been entirely devastated by the Great War, and then by an unnamed plague. Only a few small camps remain. Turck is taken captive but escapes, accompanied by a beautiful young woman—no wonder, since Burroughs is also the inventor of the incomparable Dejah Thoris. In this future world, mainland Europe lies under the control of the Abyssinian Empire, its grasp extending as far as the ruins of Berlin; against the Abyssinians, the “yellow men from the east and north” contend for mastery. As Turck moves across the face of Europe and into Asia, he sees firsthand the consequences of unbridled warfare. In truth, The Lost Continent is a bit thin. There are several action-adventure scenes that keep the story moving, but the latter chapters seem rushed (the book is quite thin itself) and more summarized than explored. Still, it goes far to suggest what Burroughs conceived as a possible outcome to the war waging on the Continent at the time he was writing, and to warfare in general. He presents an optimistic picture of the peaceful Pan-America, in which almost all of the (then) contemporary issues had been resolved, war made a matter of intellectual study only, and life essentially perfect (if a bit boring). The novel is a piece of its time. It feels more than a bit like H.G. Wells’ 1910 novel When the Sleeper Wakes and his1936 film, Things to Come. There is more than a touch of Jonathan Swift’s The Gulliver’s Travels, with the representative of Burroughs’s world struggling to make sense of the curiosities he encounters. And, of course, there is the constant bravado of Tarzan himself, of John Carter of Mars (about who Burroughs wrote several stories at the same time as he was writing The Lost Continent), and David Innes of Pellucidar. As a look at the future from the past, it is entertaining and enlightening.